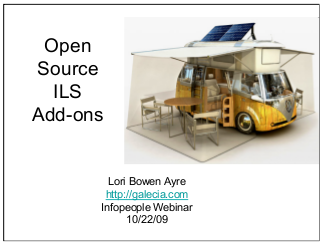 Third of a three-part series of webinars on open source library systems sponsored by Infopeople Califa, and the Open Source Library Consortium. The goal of the webinar was to share information about free and open source software that extends the capabilities of the library's current ILS, whether it is an open source system like Koha or Evergreen or a proprietary system like Millennium, CARL, or Horizon. The webinar focused primarily on discovery interface and metasearch products.